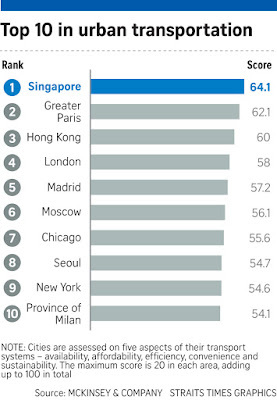 Besides Singapore, other Asian cities in the top 10 for public transport included Hong Kong, Seoul and Beijing. 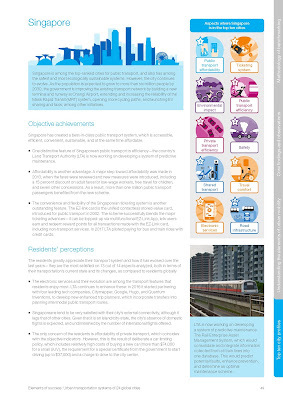 In Hong Kong, 83 per cent of residents surveyed were satisfied with the overall public transport situation. The report said Hong Kong's system has one of the best public transport coverage ranges in the world, with 75 per cent of the population and 94 per cent of workplaces being within 1km of a metro station. The city's ticketing system, the Octopus chip card, also ranked No. 1, alongside Singapore's ez-link card. The report said the Octopus card is used by 99 per cent of residents not just for payments but also for non-payment uses such as office building access. Together with Singapore and Paris, the report also lauded Hong Kong's public transport safety, with the three cities having much lower rates of public transit fatalities per million people compared with other cities. Hong Kong's use of apps in the public transport system was another positive - one of the apps is even able to help the visually impaired use, for example, Google Maps. Seoul ranked in the top three for its public transport efficiency, with McKinsey saying that "Seoul and Singapore are distinctive in average wait time and share of dedicated lanes". As for Seoul, the report said: "Such progress is driven by the optimisation of bus routes and construction of exclusive median bus lanes that increased bus speeds by an average of 30 per cent." The city also has an intelligent bus management system that helps buses stay on schedule. 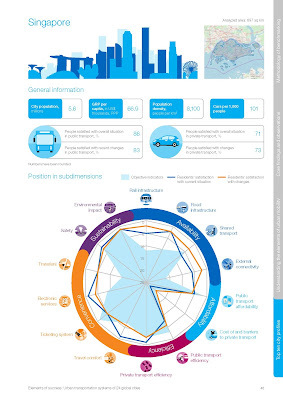 Like Hong Kong, Seoul scored high marks for its rail and bus network coverage. The city attained an 84 per cent satisfaction rate for the overall public transport situation. The report found that residents are able to use transport apps and access Wi-Fi in buses as well as at metro and bus stations. Beijing was lauded for its comfortable transport system, with the report finding that the city has one of the most modern transport fleets. 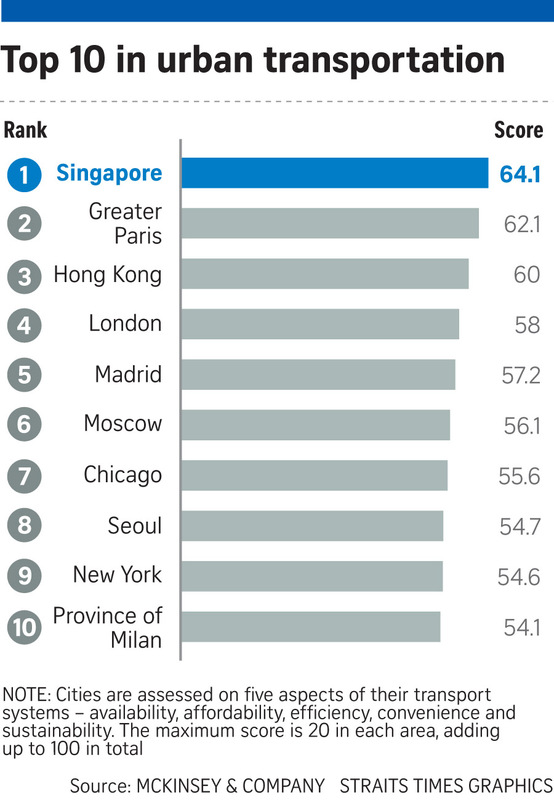 It also surpassed Singapore in its rail infrastructure ranking, coming in 10th, ahead of Singapore's 12th. Singapore has come out second in terms of transport fare affordability in a study of 12 major cities conducted by the Nanyang Technological University (NTU). 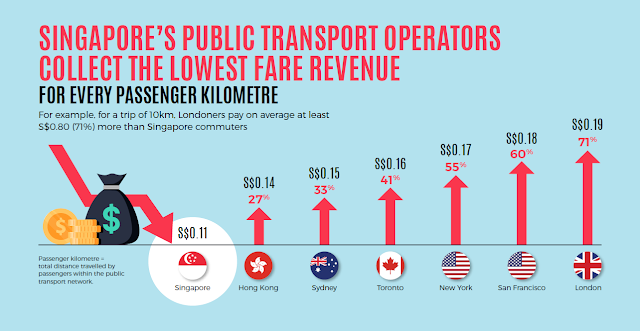 Commissioned by the Public Transport Council (PTC), the study also found that Singapore collected the least fare revenue per passenger kilometre travelled among the cities surveyed. This, the authors warned, was "not necessarily sustainable for public transport operators given the rising operating costs worldwide". Fare affordability was measured as the proportion of disposable household income spent on public transport for the second quintile household group - referring to the income group just above the bottom 20 per cent who take public transport - in 2016. 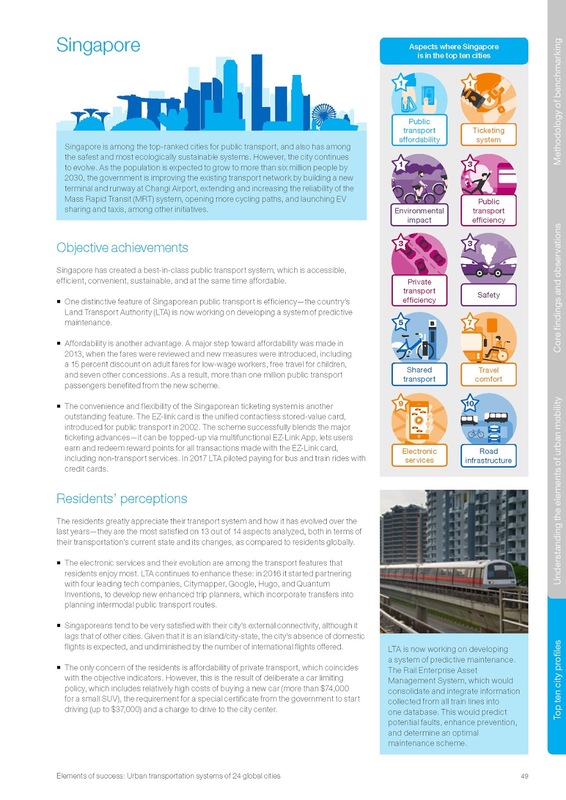 This is in line with the PTC's monitoring of fare affordability for this category, seen as the group most likely to depend on public transport regularly. The study compared 12 cities - Beijing, Hong Kong, London, New York City, Paris, San Francisco, Seoul, Singapore, Sydney, Taipei, Tokyo and Toronto. Singapore had an index score of 4.8 for affordability - meaning that on average, a typical family using public transport on a daily basis here spends about 4.8 per cent of its disposable income on public transport. San Francisco scored 4.1, topping the list. 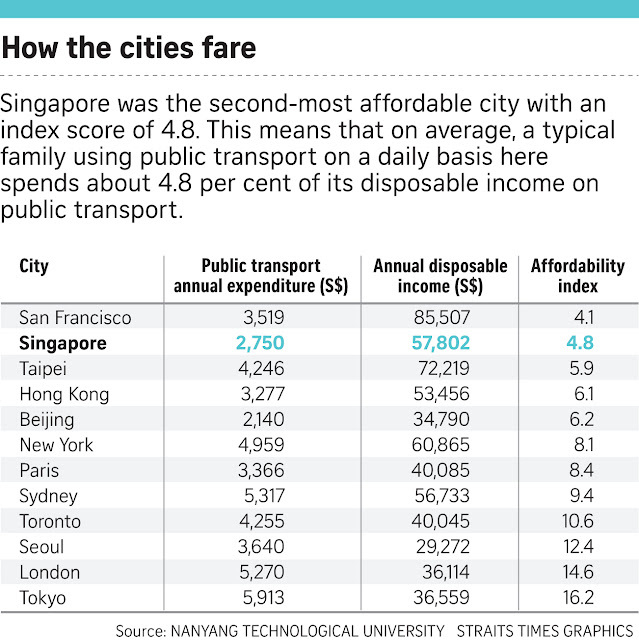 While public transport expenditure in the American city is 28 per cent higher than in Singapore, the disposable income is 48 per cent higher. The findings are in line with a report by consulting firm McKinsey in June, which ranked Singapore top for affordability. The report pointed to the 2013 fare review - which introduced measures such as a 15 per cent discount on adult fares for low-wage workers - as a "major step towards affordability" for the Republic. The NTU study also found that in 2016, fare revenue per passenger kilometre in Singapore was 11 cents for the entire public transport system. In comparison, fare revenue for London was the highest at 19 cents per passenger kilometre. This means that for an average trip of 10km, Londoners paid at least 80 cents more than commuters here. The study said the PTC needs to "strike a better balance between fare affordability and cost recovery" in order for the Republic's public transport system to be more self-sufficient. Singapore University of Social Sciences transport economist Walter Theseira agreed, saying: "We need to have in place a robust system of having commuters paying a reasonable fare for the service that they're getting." The Straits Times reported last month that transport fares could go up by as much as 4.3 per cent - or 10 cents a journey - next year. During the debate on his ministry's budget in March, Transport Minister Khaw Boon Wan said cheap fares were not sustainable. "While transport fares must be affordable, we must be careful that they are not priced too cheaply, as maintaining a high-quality transport system requires resources," said Mr Khaw at the time.